To reduce oedema BKA amputee should perform alternate knee flexion and extension. The knee disarticulation and TF amputee should perform alternate hip flexion and extension, hip ADD and ABD. These active exercises must be performed at regular intervals during the day (10 repetitions per hour). Bilateral activities often achieve a more vigorous contraction on the amputated side. Passive extension of a TT residual limb. The physiotherapist's hands should be positioned as proximal as possible to avoid any contact with the end of the stump, which is a very sensitive area. 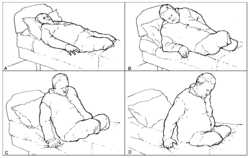 Desensitisation is believed to reduce pain, help with tolerance and touch in the residual limb and may help the patient with an amputation adjust to his or her new body image that now includes limb loss. Massage and tapping can be started early on and could be done over the soft dressing or when it is off. All these techniques could be done by the therapist and also taught to the patient/family member to do. Also instruct the patient how to perform desensitization and distraction techniques to reduce the phantom pain. Massage the entire residual limb with 1 or 2 hands by doing soft gentle kneading. Be cautious over the sutured area. Once the sutures or clips are removed you can increase the pressure on the deeper muscles and soft tissue. 5 Minutes 3-4 a day or as needed to to reduce phantom limb pain. The residual limb should be tapped with fingertips (not the fingernails). This helps to make the residual limb less sensitive to touch and will improve the tolerance to touch. Start by using a soft material, like a cotton ball, to gently rub the skin in circular motions. Progress by using a rougher material, like a paper towel, and then progress to a towel or cloth until you can tolerate these materials. This will keep the scar from adhering to the underlying tissue as it could be the cause of pain and blisters when the patient start wearing a prosthesis. Performed when the soft dressing or compression is off. Place two fingers over a bony portion and by keeping the fingers on the same spot make a circular motion for 1 minute. The ideal stump is one that is well-healed, has good vascular supply, soft and mobile scars, minimal pain, minimal oedema, a length sufficient for biomechanical leverage but not too long to restrict choices for prosthetic components, and large surface areas for distribution of pressure. While the surgery plays a large part in creating the ideal stump, Physiotherapy is required to maximise chances of achieving this ideal. One of the main acute post-operative factors affecting the time to prosthetic fitting and the speed of rehabilitation, is the wound healing of the stump, especially in the vulnerable vascular compromised population. Oedema in the residual limb is also a common complications after LLA surgery. Controlling the amount of oedema post-surgically is vital for promoting wound-healing, pain control, protecting the incision during rehabilitation and assisting in shaping the stump for prosthetic fitting. Traditionally soft dressings or non-adhesive elastic bandages are used to prevent oedema of the stump post-surgically, but no evidence supports the use of these bandages. The use of immediate post-surgical rigid or semi-rigid dressings to prevent acute oedema have increased in popularity in the developed world, and is well supported by evidence in the literature. Descriptive studies indicate several disadvantages of soft dressings, such as high local or proximal pressure, tendency to loosen or fall off, limited mobilization, and extended hospital stays. Controlled studies found that the frequency of uncomplicated healing rates, postoperative pain, eventual use of a prosthesis, and mortality were not significantly different between soft and rigid types of dressings. Rigid dressings - rigid dressings have been used as best practice for post-operative stump management for many years. Some of the reported benefits of the rigid dressing include promotion of wound healing, shaping of the stump, pain management, protection against trauma during falls, stump volume control and increased speed of prosthetic fitting. An alternative vacuum-formed removable rigid dressing has proven to be as effective as the conventional rigid dressing in a randomized controlled trial, and is an useful alternative to the plaster casting method. The advantages of this Removable Rigid Dressing include the ease of application, and ease of access for wound inspection. This dressing can be used for 5-7 days after surgery. When compared to soft dressing, RRDs is better as it leads to improved healing times, less oedema, shaping of the residual limb, prevention of knee flexion contractures, and prevents trauma to amputated limb. In the BACPAR guidelines for oedema management in lower limb amputees they conclude that based on the best current available evidence rigid/semi rigid dressings should be used when expertise, time and resources allow; the benefits are well documented in the literature. The PPAM aid, compression socks and stump boards have been shown to have some evidence base for oedema control and may be used in addition or in the absence of rigid dressings dependent on clinical judgement. However, these modalities are not necessarily primarily intended for use for oedema control. Their advantages include preparation for prosthetic rehabilitation, reduction in flexion deformities and maintenance/improvement in muscle tone and are important components of amputee rehabilitation. Compression socks and the PPAM aid are the only tools available for transfemoral amputees. Although compression socks are widely used as a form of oedema control there is very limited evidence on aspects such as timing of application, who should assess appropriateness and the frequency it should be worn for. It is suggested that further research is required in order to offer more clarity for clinicians in these areas. Wound healing is always a cause of concern, but especially in the dysvascular population. Adequately controlling oedema of the stump can assist with healing, but some evidence also supports the use of low intensity laser in order to facilitate and speed up wound healing in diabetic patients . However the exact dosages for optimal effect has not yet been established. Pain is a very common physiological stressor that occurs during the acute postoperative period and affects the patient’s ability to learn new skills  . Adequately controlling the new amputee’s levels of pain greatly facilitates their early rehabilitation  . Physiotherapists should take this into consideration, and treat patients shortly after receiving their pain medication. Controlling oedema in the residual limb through positioning also assists in relieving acute postoperative pain . Various physiotherapy interventions are used for the management of phantom limb pain, but very few of these have been studied to prove their efficacy in the research literature . One of the few physiotherapy modalities that has been proven to be effective for the management of phantom limb pain, is a 60 minute application of Transcutaneous Electrical Nerve Stimulation (TENS) . For more information see the pain management of the amputee page. A series of useful patient information guides from the Amputee Coalition. Moving up and down on the bed. The main goal of a good positioning at any time is to prevent adjacent joint contractures. For the trans-femoral amputee and knee disarticulation amputee - the full ROM of the hip, especially extension and adduction. Patient should be advised on how to position themselves while sitting and lying in the hospital bed or standing to prevent contractures. For trans femoral: avoid position with hip flexion and abduction (cushion under the stump for example). ↑ Ottobock. How to prevent muscle contractures through moving the residual limb? ↑ 10.0 10.1 10.2 10.3 10.4 10.5 Lusardi MM, Postoperative and preprosthetic care. In Lusardi, MM, Jorge, M and Nielsen, CC editors. Orthotics and Prosthetics in Rehabilitation, Third Edition. Missouri: Elsevier, 2013.p. 532-594. ↑ 11.0 11.1 11.2 Nawijn SE, Van der Linde H, Emmelot CH, Hofstad CJ. Stump management after transtibial amputation: a systematic review. Prosthetics and Orthotics International 2005; 29(1); 13-26. ↑ Johannesson A, Larsson G, Ramstrand N, Lauge-Pedersen H, Wagner P, Atroshi I. Outcomes of a standardized surgical and rehabilitation program in trans-tibial amputation for peripheral vascular disease: A 10 year prospective cohort study. The American Journal of Physical Medicine and Rehabilitation / Association of Academic Physiatrists 2010; 89(4); 293-303. ↑ 15.0 15.1 Reichmann JP, Stevens PM, Rheinstein J, Kreulen CD. Removable Rigid Dressings for Postoperative Management of Transtibial Amputations: A Review of Published Evidence. PM&R. 2018 May 1;10(5):516-23. ↑ 19.0 19.1 19.2 19.3 Barbara Engstrom and Catherine Van de Ven. Therapy for Amputees, 3rd Edition. 1999.